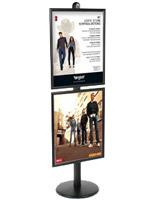 Snap Open Frames : This poster stand features 4 frames for maximum exposure! This BRAVA poster display stand presents your 22" x 28" posters without hanging them from a wall or ceiling. 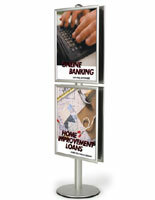 Use a poster display stand in malls, retail stores, lobbies, and trade shows. With four snap-open poster frames, this poster display is an excellent way to promote your product, company or up-coming event! 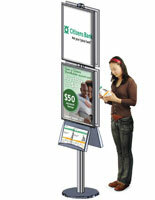 Standing an eye-catching 6ft tall, this standing poster holder will grab attention and remain steadfast in high traffic areas. With four snap frames, this poster display stand can advertise a variety of products while retaining a polished appearance. 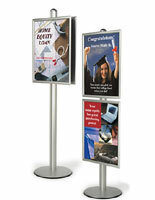 As a double-sided display, you will also be able to attract attention from all directions! This BRAVA poster display stand, also called a standing poster frame, is comprised of a 6ft brushed aluminum pole, sturdy base and four aluminum frames. Grooves along the display pole allow you to adjust the frames to any appropriate height. To attach the snap frames to the pole, slide the connectors along the pole's grooves. Adjust the poster frames to whatever height you desire and tighten the screws. 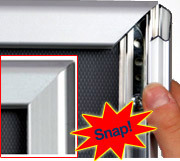 The snap-open frames are also easy to load with signs, posters, and graphics. Just snap open the sides, place your poster inside and snap shut. You are now ready to advertise in style! We sell this poster display stand with lexan covers to protect your graphics while they are on display and reduce glare. A standing poster frame like this BRAVA poster display stand can be moved around to make use of your floor space. While it can be moved, however, this poster holder is a sturdy display stand that will not wobble or fall over. With a base weighing 20lbs, this poster display stand will not be knocked over unintentionally. As such an attractive and durable unit, this standing poster holder makes a great addition to trade show or in-store displays! The display stands come with wall screws to give you the option of using the frame as a wall display. These screws are not necessary for assembling your otherwise. **This snap frame display stand is intended for indoor use only. 21.0" x 72.0" x 17.0"